You probably aren't expecting me to talk about Downey's New Year's Day Rose Parade float in July. 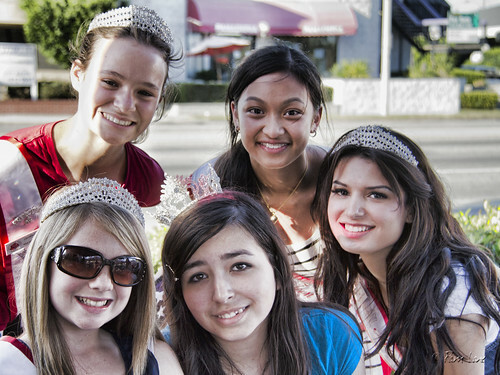 But here we are, at the Downey Rose Float Association's 4th of July fireworks booth, where these girls are working to bring in the crowds to purchase their fireworks. 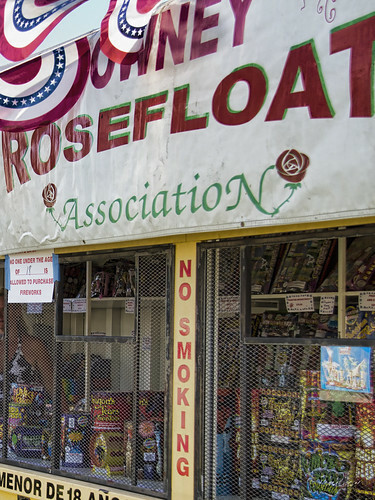 Downey allows only the "Safe and Sane" fireworks to be sold (and used) inside the city. Nearly every organization in town staffs a fireworks booth to raise funds for their group. The booths are allowed to open only from July 1 through July 4, and someone must be on the premises around the clock to guard the goods. So typically, next to each booth, you'll also see a mobile home where the "guards" stay during their night shifts. Last year's float won the Lathrop K. Leishman Trophy for most beautiful entry from a noncommercial sponsor. Next year's float has already been designed, with the theme of "Enchanted Paradise." Volunteers are always welcome (especially in December).